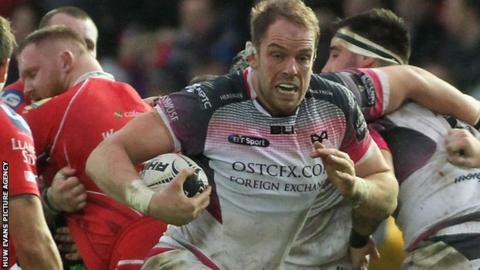 Ospreys were given "a let-off" in their dramatic 27-26 win in Boxing Day's Pro12 Welsh derby at Scarlets, says the visitors' captain Alun Wyn Jones. Scarlets fly-half Steven Shingler missed a last-minute penalty that could have given the league leaders the win. Despite holding on for victory, Jones told BBC Wales Sport: "It was a bit frustrating from us, to be honest." Scarlets skipper Ken Owens felt his side gave their rivals too many opportunities in their own 22. "It is hugely frustrating. We gave some silly penalties away which they capitalised on," said Owens. "It was a great derby and a good display of rugby but they were slightly more clinical in taking their chances and probably deserved the win in the end. "We created plenty of chances and didn't convert enough, and they did." After a good start for Scarlets, Jones' converted try sent Ospreys in level at the break 20-20, but the Wales lock felt they could have played much better in the first 40 minutes. "We've been trying to play with a bit more width but you can't do that if you keep losing the ball and unfortunately we were losing the ball in the first half," Jones added. "Credit to them, they were pressuring us at the breakdown. "We feel probably we were let off in the end." For the visitors, Boxing Day's victory was only their fifth in the Pro12 so far this season. "The boys showed real character," Ospreys head coach Steve Tandy said. "If we'd lost that would have been pretty disappointing. "It goes back to our discipline and we've got to smarten up a little bit. "When we had the ball we looked decent, but we didn't keep it for long enough. "But to come to a place where not many people win is really a positive for us."